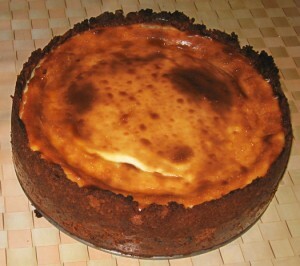 This weekend I baked a cheesecake to take to a dinner party. It wasn’t really a big deal. I’ve been baking cheesecakes for almost 40 years. I bake them because I like to eat them and I learned to eat them when I was still in college, at Pratt Institute in Brooklyn. 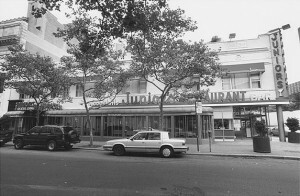 Downtown Brooklyn had a restaurant named Junior’s and we Pratties ate there on special occasions, usually when we had a little bit extra money. The restaurant wasn’t expensive but we were pretty poor. Junior’s cheesecake was known as the best cheesecake in New York City. One week, when I still lived in Brooklyn, I went there 3 times (I was already working by then so I had some extra money). I ate 2 slices of cheesecake there and the third time I bought a whole small cheesecake to take home to eat. Now in those days a single slice of Junior’s cheesecake was about 3 or 4 inches high and a pretty big wedge. The small cake was about 8 inches in diameter though not so high. Also, in those days, it didn’t matter how much cheesecake I ate, I never gained weight. Those days unfortunately are gone. But, after that week, I didn’t eat cheesecake for almost 2 years. I think I OD’d. I baked my first cheesecake when I think I was still at Pratt. My friend Irene told me that they were really hard to bake and I guess I took that as a challenge. It wasn’t so hard. There have been lots of different recipes through the years. That first one had pineapple on the bottom, just above the crust. I thought I had lost that recipe long ago but a few years ago I was rummaging in some of my still unpacked boxes of books from New York and found my Joy of Cooking, from the early 70s. There in the cookbook, was an index card with my pineapple cheesecake recipe on it. I still haven’t bothered to bake it again though. A few years ago I was looking for a Cheesecake recipe to bake for a party. I needed one that had no flour in it because my friend, Amy, was allergic to wheat flour. Most of the cheesecake recipes I had contained flour. So I googled and got a ton of recipes to choose from. But, the question was, how did you pick one that was good. Then I saw one that was named Junior’s Cheesecake and was supposed to be the original recipe from way back when. So that’s how I chose. It used cornstarch instead of flour. And it was very easy. Now I just want to say that I’m a purist. I like my Cheesecake plain – not with all that fancy stuff on it. No strawberries, or pineapples or anything else on top. I once made a chocolate marbled cheesecake that was great though. And I won’t turn down a taste of cheesecake just because it has something on top of it. But I prefer it plain. I used to always use just a simple Graham Cracker bottom but now I live in Sweden so I can’t find Graham Crackers. I use various other types of cookies for the bottom instead. For my wheat-allergic friend’s cake I used special wheat-free cookies. Often, I use Swedish pepperkakor (gingerbread cookies) and feel that I’m combining two cultures together, the New York Jewish with the Stockholm Swedish. Anyway, the reason I’m even writing about cheesecake is because I wrote on my Facebook page that I was baking a Junior’s cheesecake – mainly to bring back memories to all my fellow Pratties on Facebook. But a whole bunch of people wrote to me wanting my recipe. And everyone at the dinner party wanted it too. So I decided to write about cheesecake. I started out by regoogling for the recipe. And now, I’m not sure this really was exactly the way Junior’s makes their cheesecake because I’ve found other recipes called Junior’s cheesecake that have a different bottom made from spongcake. But I’ve never made a sponge cake bottom so this is my version. The filling tastes exactly like my mouth remembers it in any case. If any of you former Pratties remember what the bottom was like, let me know. I still like mine though. This recipe was supposedly developed by baker Eigel Peterson in 1950. And it comes from The Brooklyn Cookbook by Lyn Stallworth and Rod Kennedy, Jr. This cheesecake has a buttered crumb bottom that climbs up the sides a bit and nothing on the top. It is a very dense and heavy cheesecake – not the light fluffy kind. I didn’t follow the original directions exactly. I’m not good at that, really. Following directions, I mean. So this is my version. Cheesecakes should be made in springform pans. That’s the kind that you can take the sides off of. The pan I used is 8 ½ inches or 22 cm in diameter. 2 tablespoons unsalted butter, melted – I use whatever I have, salted or unsalted, or even Bregott (a Swedish butter-canola oil combination) and I don’t really measure. It just has to be enough to blend with the crumbs. Graham crackers all crumbled up. The crumbs don’t have to be completely uniform in size. Here in Sweden I can’t find graham crackers so I use other kinds of cookies, such as Swedish pepperkakor or even wheat-free cookies for my wheat-allergic friends. You can even use chocolate cookies and add chocolate chips to the batter if you want. But then, it’s not very plain anymore, is it. 7/8 cup Sugar (2dl) This is good if you don’t want it too sweet. A full cup is OK too. 3 tablespoons Cornstarch sifted so it’s not clumpy. 30 oz. Cream cheese (850 g), Take this out of the fridge in advance so it’s not too cold anymore. I try to only use Philadelphia brand cream cheese. And I never use the light version. Tried that once. Yech. 1 Extra-large egg They don’t have extra large here in Sweden, so large has to do. 1 teaspoon vanilla I use the liquid kind but I guess the Swedish Vaniljsocker is OK too. Crush the crackers/cookies to very small crumbs. Mix the crumbs with the melted butter. I sprinkle on a tiny bit of cold water to make the crumbs stick together better but don’t overdo this. You don’t want gooey crumbs just crumbs that stick together. Coat the pan bottom with the crumbs, pressing them onto the bottom and up the sides a bit. Don’t make it too thick but you shouldn’t be able to see the bottom of the pan. I don’t bother to bake it before adding the filling but I did put it in the fridge till I was ready for it but I don’t think you have to. Mix the sugar with the cornstarch. Put a package cream cheese in a bowl and start to mix it with a mixer. Add some of the sugar/cornstarch mixture to the cream cheese. Add more cream cheese. Add more sugar/starch mix. Do this till all the cheese and sugar is being mixed together. Blend in the egg and mix till its evenly blended but not on high speed. Add the heavy cream, a little at a time, and mix. Add the vanilla. Spoon batter into the crumb-filled pan. Bake for approximately 40 to 45 minutes, until the top is a light golden brown. The cake can jiggle a little bit and still be done. Put the cheesecake in its pan on a rack and let it cool till you can put it in the fridge. Because not everyone likes plain cheesecake I usually bring with me some frozen berries, like raspberries or blackberries that can defrost during dinner and be eaten later with a slice of cheesecake. I, of course, eat it plain, with a cup of tea on the side.